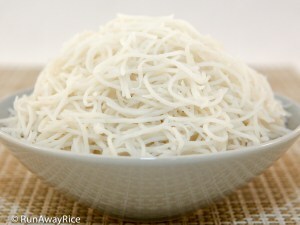 Make fresh Rice Noodle or Rice Vermicelli (Bun Tuoi) at home with my easy recipe. This no-frills recipe doesn’t require a fancy pasta machine but just an inexpensive potato ricer to make the most delicious noodles. Gluten-free and healthy, these fresh noodles are simply amazing! 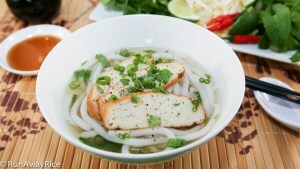 Serve the rice noodle in your favorite noodle soups, bowls, spring rolls and salads. Enjoy! 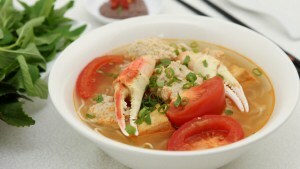 Tapioca starch gives the noodles a chewy texture. 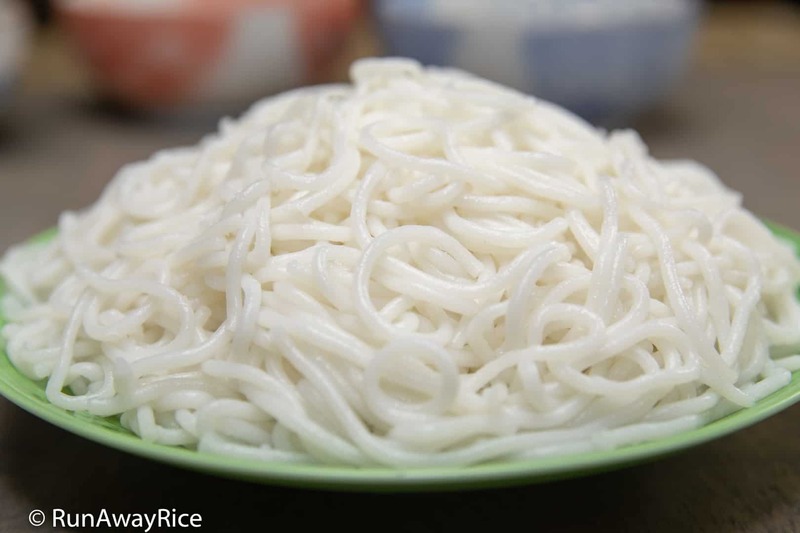 If you would like a chewier noodles, increase the tapioca starch while decreasing the rice flour in equal amounts. Xanthan Gum provides elasticity to the noodles. It’s a common ingredient used in gluten-free foods. 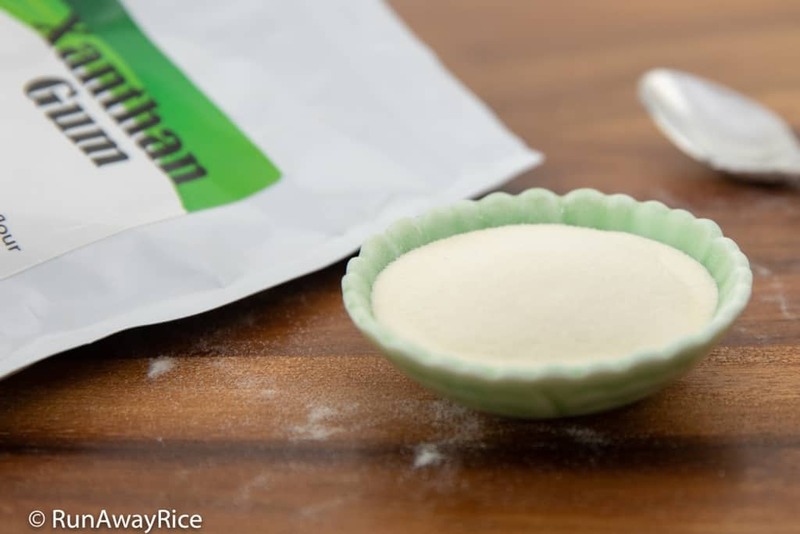 Xanthan Gum acts as a binder and the “gluey” component needed in batters and doughs. 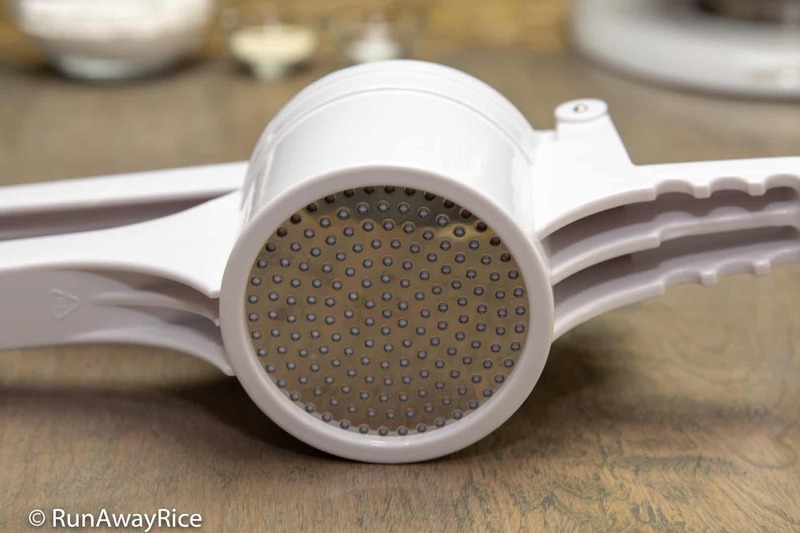 This inexpensive potato ricer makes rice noodles quickly and easily. Use the disk with the smallest holes. For making rice vermicelli, a thinner noodle, I made a disk with 1/16th inch holes. If you’d like to see how I made this disk, check out this post: How to Make a Vermicelli / Thin Noodle Disk. Fill the potato ricer three-quarters full with batter. Press down on the handle in a smooth and quick motion to extrude the batter. Keep in mind: the noodles cook really quickly, about 60-90 seconds. Once they float to the top, they are done. Avoid overcooking as this makes the noodles mushy. 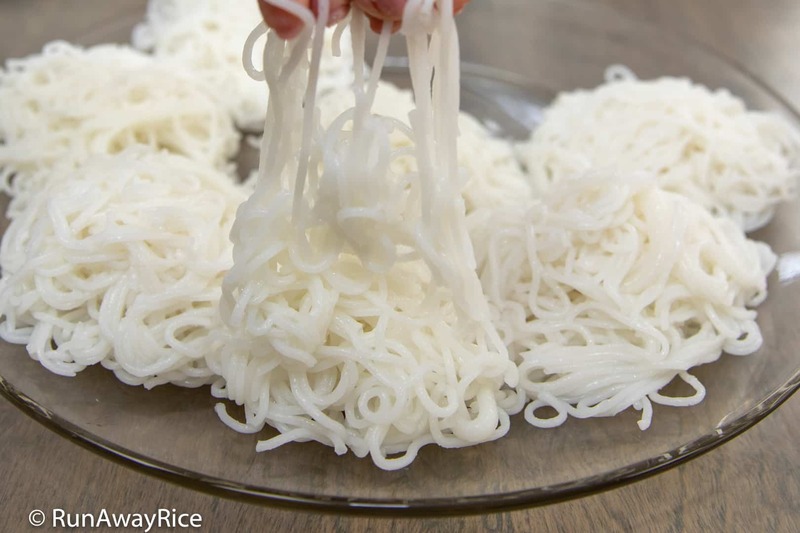 Make fresh Rice Noodle or Rice Vermicelli (Bun Tuoi) at home with my easy recipe. This no-frills recipe doesn't require a fancy pasta machine but just an inexpensive potato ricer to make the most delicious noodles. Gluten-free and healthy, these fresh noodles are simply amazing! 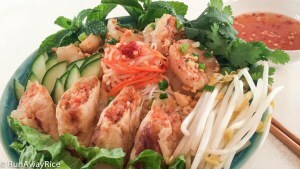 Serve the rice noodle in your favorite noodle soups, bowls, spring rolls and salads. Enjoy! In a medium saucepan, add 1/2 cup rice flour, salt, water and vegetable oil. Whisk together until the flour is dissolved and the mixture is smooth. Heat the mixture over Medium High heat stirring constantly. (In 2-3 minutes, the mixture should start to thicken. Continue stirring bringing it to a gentle boil.) Once the mixture starts bubbling, turn off the heat and continue whisking for another minute, making sure the mixture is smooth. Set aside and let the batter cool for 15-20 minutes. In the bowl of a stand mixer, add the remaining 1 1/2 cups rice flour, tapioca starch and xanthan gum. Mix on Low speed for 15 seconds, blending together the dry ingredients. Add the batter prepared earlier. Using a flat beater, mix on Low speed for 30 seconds or until mostly incorporated. Scrape down the beater and around the bowl, working in any remaining dry ingredients. Mix on Medium speed for 1 minute or until the batter is fluffy. Transfer small amounts of batter into the potato ricer filling it three-quarters full. Bring a large pot of water to a rapid boil and add 1/2 Tbsp vegetable oil into the water. Fill a large colander/bowl with ice water and have it ready nearby. Also have a salad spinner or large colander ready in the sink. Using a large spoon, swirl the water around a few times to get it moving. Holding the potato ricer over the boiling water, press down on the handle smoothly and quickly, extruding the batter into the water. Once all the batter is extruded, dip the potato ricer into the water and swirl around a few times to release the noodles. Gently stir the noodles. When the noodles float to the top, use a skimmer to scoop up the noodles and transfer into the cold water bath. Swirl the noodles in the cold water for 30 seconds. Drain and transfer the noodles into the salad spinner. 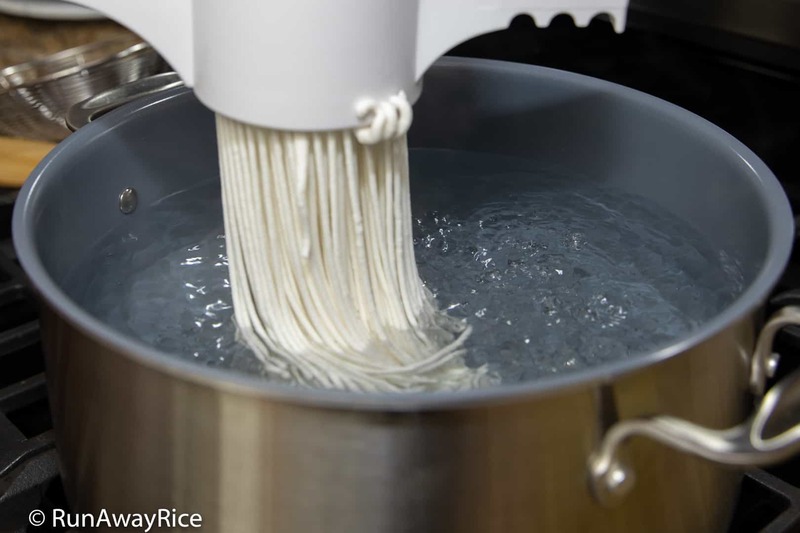 Rinse off the starch by swirling the noodles in cold water for 1 minute and then draining. Repeat this process again or until the water is no longer cloudy. Use the salad spinner to remove the remaining water. 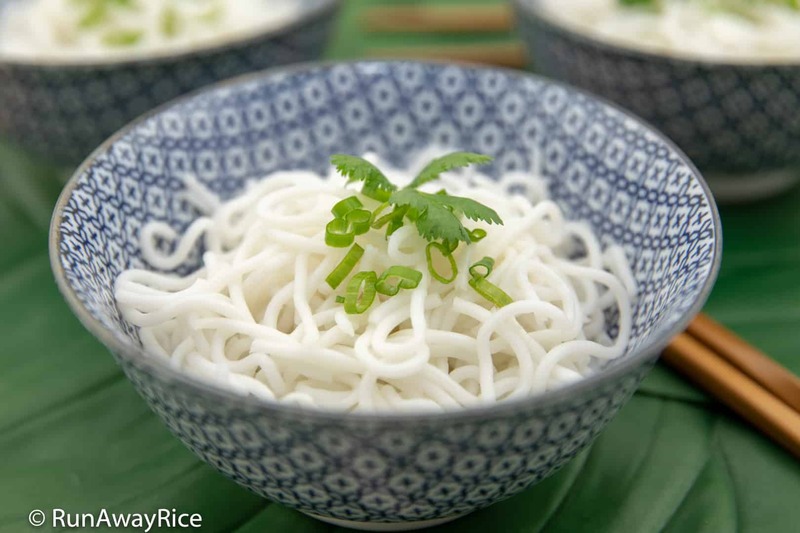 If serving right away, transfer some rice noodle into individual bowls. 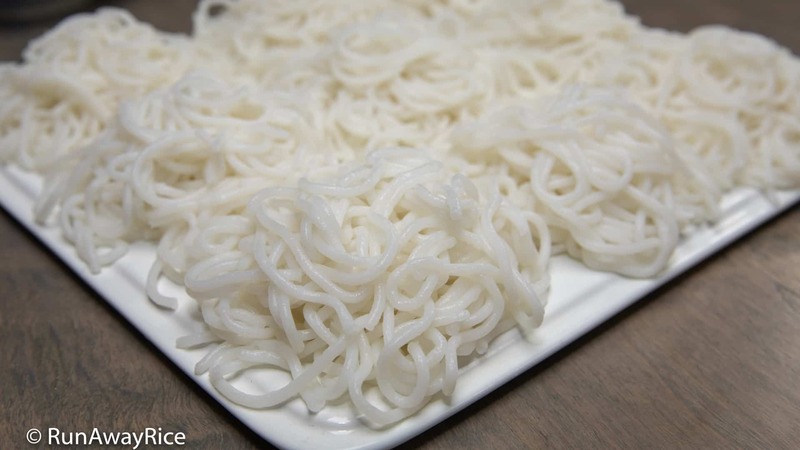 Optionally, make small noodle mounds on a large plate for serving later. The rice noodles are best enjoyed the day they are made. Refrigerate any remaining portion and enjoy within 3-4 days. I was wondering if it would be possible to do this without the addition of Xantham Gum? My mom is often wary of chemicals that she doesn’t know about. 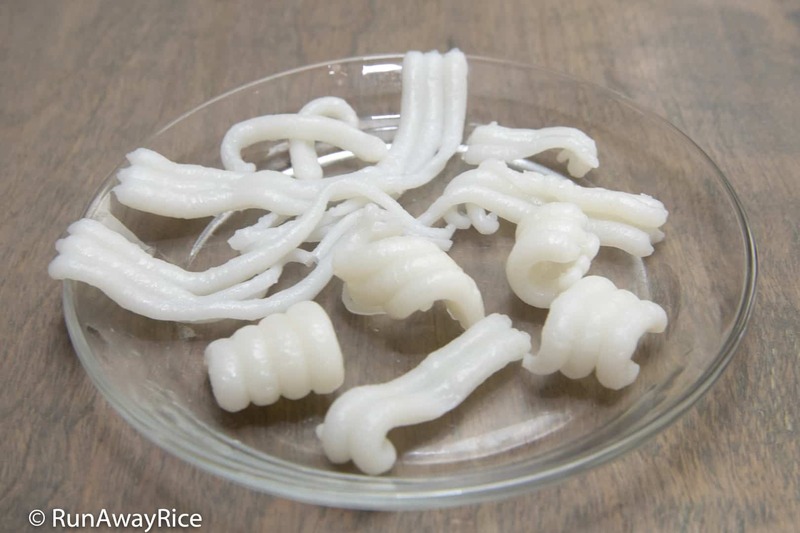 You mentioned in your video that you would explain how to make the vermicelli noodles thinner by making another ricer mold? Is there a way to make the noodles and dry them instead of cooking them? Wonder if flouring as they come out of the potato masher would work? Then once the noodles dried, shake off the excess flour. Store in a dry no moisture container. I have not tried flouring and storing for later use. It’s worth a try. The batter is a sticky. The noodles may stick together before you’ve had a chance to flour them. You reduce the water in the batter and make it more like a dough (not too much or it’ll be hard to extrude.) I’ll have to try this the next time I make these noodles. If you give it a go, please share your results. I’d love to hear about it. Good Luck!